Teaching a new craft is a tricky thing and teaching sewing to people whose third language is English is a VERY tricky thing. Two groups of ten adventurous souls decide to tackle the tailoring class set up by Erica, Jeanie, Morgan, and Siobhan and timidly make their way into the sewing room where seven sewing machines and a cutting table await. Pounds and pounds of buttons, scissors, yards of various colorful cloth, threads of all types and colors, seam rippers, and much more are standing at attention, ready to be used. Nine young ladies and a young man are the first group to take a class and they learn about cutting and straight stitching, quietly trying to explain directions given to them in British and American English. Some of the learners are quick and grasp on quickly while others struggle to make a straight line, but classes continue and before long, a rhythm is born. 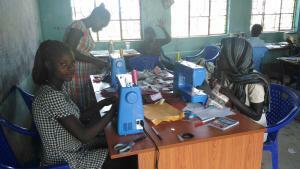 Day passes a day and pad kits start taking shape, with the various components being sewn by eager students. Bags, shields and liners are checked for quality, with the duds being sent back to Juju for seam ripping so that a second attempt can be made. They learn how to use their feminine kits and why they are important. They are so excited to know that they can go to school and to work without worrying that biology will stop them once a month. What a gift! Beautiful certificates have been created for each participant and each student is tested today to see what skills they have learned. Learned this week: threading the machine, catching bobbin thread, bobbing threading, inserting and removing the needle, straight stitching, zig-zag stitching and reverse stitching, basic reading a pattern and placing it on the fabric, limiting fabric waste, proper use of cutting board, and pinking edges. Yahoo!! These 20 are so excited to be part of something that can help them in their near and far future. We will leave knowing that Francis and Elizabeth have the knowledge to carry on the training, building a small business that will help the community. The week not only includes sewing lessons, but also includes the painting of a clinic and of a school, planning sessions for the sisal project, meetings with farmers and workers, ensuring that water filters are set up at the orphanage and school, making sure that solar lights are available for the school, and that all the clothes that were brought are inventoried and ready to be used. We hem uniforms and sew on buttons, we make sure the school kids have enough uniforms for their soccer team, we host a party, take a million photos, and astronomy classes are taught. It is a busy week, full of good things. We also have some bouts of a 24-hour virus which goes through the team, leaving only two members unscathed. After a long, hot day, where my children’s flipflops grow noticeably ragged, our work day ends with a celebration. A dancing crew known as “the Crickets” sing and dance for us, calling each of us into the dance. Some of us are not known for our dancing skills, but we give it a shot and laugh as we move. The ladies love it and the high-pitched sound that signifies happiness and joy resonates is heard all around us. My ears are full of sound – stomping, laughing, clicking, snapping, ululating, music, Luo, and happiness. Students receive their certificates and feminine pad kits (men take kits home for their wife or sisters) and proudly pose for photos after shaking hands with their trainers. It is a week to remember – the team and the community coming together to do something good.